Once, at a meeting of the Wagner Society of New York, I participated in an informal, pre-program discussion led by Leon Botstein on the topic of the order of the movements in Mahler’s “Tragic” Symphony. Although there are historical and biographical points to be made about the Andante coming immediately after the first movement, it is clear (well, to me anyway) that the Scherzo should follow the first movement as an adjunct enforcer of the intensity of the work’s opening. After these two electric movements, the Andante softens the blows of the hammers to come in the finale. Even Leonard Bernstein, revered by many as a Mahler expert, placed the Scherzo second, including in his later years. However, many informed scholars undertake the opposite argument, the only problem being that they are wrong! 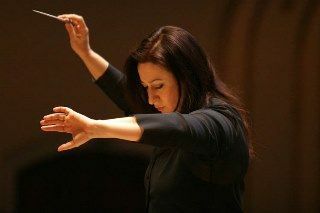 Australian conductor Simone Young substituted on short notice for music director Jaap van Zweden who, it was announced, had suffered a severe burn on his shoulder. Ms. Young is what I would dub a member of the old school of conducting and I found her style quite nostalgic. She is very generous with her gestures and adds to the drama with a large armamentarium of arm and hand movements. This style of conducting was the norm in the 1930’s and ‘40’s and had as its last practitioner Maestro Bernstein. Those of us who grew with Mahler in the 1950’s can rejoice that there are still a few maestros (or maestras) who are not ashamed to nudge their forces with expressive movements of their own! If this reviewer was at all on the fence about Maestro van Zweden, he knocked me off onto his side by programming the movements in their original order, the Scherzo regaining pride of place as the legitimate second movement. Although it is his 8th Symphony that is dubbed the “Symphony of a Thousand” (because of the huge choir), there was not any space left on that huge Geffen stage today for another instrument. There were four harps, nine double basses, two celestas and at least 13 percussion instruments! Meanwhile, all Ms. Young had to do was rein them all in and produce a magnificent aesthetic experience. Lo and behold, she did! This conductor was clearly on top of her game. The entire work takes a bit more than one and one-half hours and Ms. Young took very small breaks between movements. Highlights included the palpable intensity of both the beginning and ending of the second movement, the sometimes overwhelming statements of the drums and the coordination of celesta, harp and strings. And when I say that this conductor did not hesitate to put her foot down, I mean that literally. Perhaps I have heard equally emotional performances of the 6th, but I cannot remember when. The 6th was the last of Mahler’s symphonies to premiere in the United States, not debuting until 1946 under Mitropoulos. Koussevitzky had requested the orchestral parts from the publisher in the 1930’s but the Nazi administration wrote to inform him that all of this material had been lost in a fire!